Adam Lyon on his No. 84 Team Lyon Racing bike. 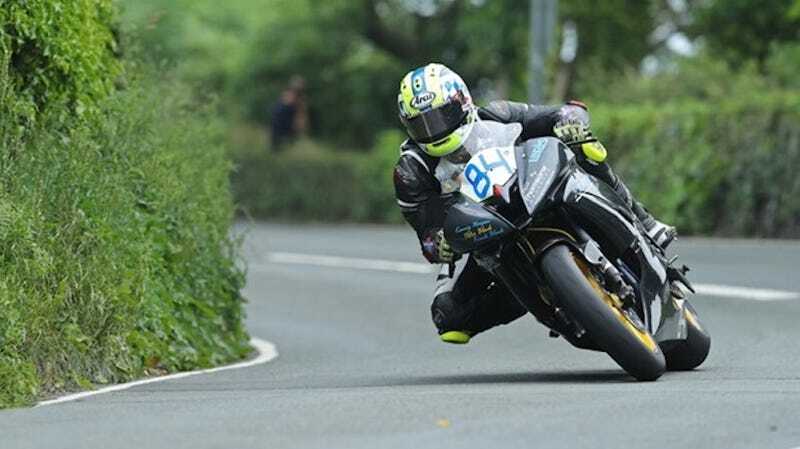 Adam Lyon, a 26-year-old rider from the Scottish town of Helensburgh, died during the a Supersport motorcycle race on Monday at Isle of Man TT. Lyon is the second rider to die in less than a week at Isle of Man, after Superbike rider Dan Kneen died Wednesday during a practice session for the event. Lyon was new to Isle of Man competition, a race that’s run on the Isle of Man island between England and Ireland, according to a statement sent out by the organizers of the race. That statement, titled “Statement on behalf of ACU Events Ltd,” is common during the annual Isle of Man races—it signals the death of another competitor, on a race course carved from public roads that’s claimed the lives of nearly 300 people in its 100-year history. Lyon was running a Yamaha R6 in the Supersport race, and started 24th of 76 riders in the race. Adam was a newcomer to the TT this year. He qualified in 24th place for today’s race with a fastest lap of 122.261 which he improved to 122.636mph on the opening lap of today’s race. His fastest lap of the TT course – 123.443 - was in Friday’s Superbike qualifying session. Adam lapped at 122.499 as a newcomer at the Ulster Grand Prix in 2017, finishing 11th in the second Supersport race. He finished sixth in the 2010 Pirelli National Superstock 600 Championship with podiums at Croft and Silverstone. Lyon was competing for his Team Lyon Racing amateur team, which posted a couple of updates from Isle of Man on Facebook toward the end of May. At the time of Lyon’s first practice session for the event, the page posted that the team was “finally” at Isle of Man “after years of hard work and prep.” In that post and another, the team expressed its excitement and thanked everyone for their messages and support. Isle of Man is in its second and final week of competition for the year, with the first week being practice and qualifying and this week consisting of the races. The event goes through Friday, with the two events that day being sidecar races.